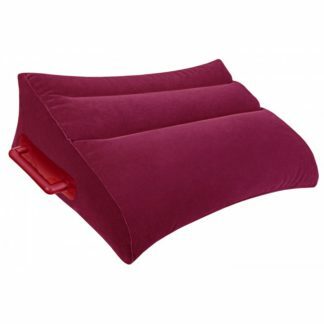 Support your positions comfortably with this inflatable, large cushion. This slanted, supportive cushion allows you to relax comfortably in any position without sliding, and the easy-grip love handles help you maintain your position, balance and rhythm. The velvet-touch material attaches easily to the wedge cushion for more slide-free options. The air seal valve makes inflating easy, and when the fun is over, simply deflate your cushion and take it with you wherever you go. It’s perfect for those romantic getaways and no one will know what’s in your bag! Easy to clean and lubricant doesn’t show. Holds up to 300 pounds.